Be sure to enjoy recreational amenities including a health club and an outdoor pool. Additional amenities at this hotel include complimentary wireless Internet access, concierge services, and babysitting/childcare (surcharge). Located in Netanya, Sea Park Hotel Netanya is near the beach, within a 5-minute walk of Netanya Amphitheater and Inter Active Atzmaut Square. 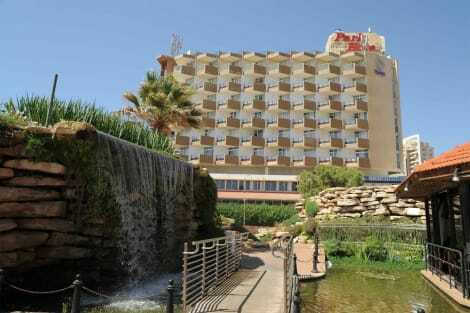 This hotel is 0.1 mi (0.1 km) from Herzl Beach and 0.2 mi (0.4 km) from Tamnun Beach. The galil hotel is located in Netanya's finest residential area and just opposite the Mediterranean. Is has has 84 spacious rooms, suitable for singles, couples and families.Each room is overlooking the sea with air-conditioning, private bathroom, telephone, radio, cable t.v., balcony and safe. Make yourself comfortable in this air-conditioned apartment, featuring a kitchenette with a refrigerator and a microwave. A flat-screen television with cable programming provides entertainment, while complimentary wireless Internet access keeps you connected. Conveniences include an electric kettle and a sofa bed, and you can also request a crib/infant bed (complimentary). Relax at the full-service spa, where you can enjoy massages, body treatments, and facials. If you're looking for recreational opportunities, you'll find an indoor pool, a sauna, and a fitness center. This hotel also features complimentary wireless Internet access, concierge services, and wedding services. Situated in Netanya and located directly above the beach with a breathtaking view of sea this property offers an ideal place of rest and relaxation. The Residence Hotel is just a 5-minute walk from Netanya's city center and a few steps away from the public lift leading to the beautiful beaches of Netanya. Free! WiFi is available in all areas and is free of charge.Pets are allowed on request, Charges may be applicable.Guests of Residence Hotel can take advantage of a swimming pool and sauna which are offered free of charge at the hotel's sister property . the Residence Beach is located at the most beautiful shoreline spot, with easy access to the beautiful promenade and the beach which you can access with the recently constructed beach elevator. it is a unique, luxurious and intimate hotel, perfect for businessmen, couples and small families seeking a quiet and relaxed atmosphere. The property features modern accommodation with views over the Mediterranean Sea. Studios and suites include a kitchenette. The hotel is located near the sea, on the Netanya's new garden promenade. It is just a 2-minute walk to the city centre, with its numerous shopping, dining and entertainment options. The property is situated right next to a lift that goes down to the beach. Renovated in 2008, the hotel is well known for its personalised service, family atmosphere and excellent kosher kitchen. It offers a total of 75 renovated rooms, as well as free hot and cold drinks at mealtimes, free wireless Internet and an Internet booth in the lobby. Facilities on offer include a lobby with 24-hour reception and check-out service, a hotel safe, lift access, a café, a bar and conference facilities. For an additional fee guests can make use of the hotel's laundry service. All of the guest rooms are air-conditioned and feature a telephone, a cable LCD TV and a fridge. An en-suite bathroom with shower and bathtub comes as standard, as well as a hairdryer and a double bed. Some rooms also feature a kitchenette. There is a golf course just 15 minutes' drive away. Featured amenities include dry cleaning/laundry services and an elevator (lift). A roundtrip airport shuttle is provided for a surcharge (available 24 hours), and free self parking is available onsite. Stop by the hotel's restaurant, Main Restaurant, for lunch or dinner, or grab snacks at the coffee shop/café. Unwind at the end of the day with a drink at the bar/lounge or the poolside bar. A complimentary buffet breakfast is served daily from 7 AM to 10 AM. When you a stay at Leonardo Plaza Netanya in Netanya, you'll be near the beach, within a 5-minute walk of Inter Active Atzmaut Square and Netanya Amphitheater. This family-friendly hotel is 0.4 mi (0.6 km) from Tamnun Beach and 1.1 mi (1.8 km) from Kiryat Sanz Beach. lastminute.com has a fantastic range of hotels in Netanya, with everything from cheap hotels to luxurious five star accommodation available. We like to live up to our last minute name so remember you can book any one of our excellent Netanya hotels up until midnight and stay the same night.